Maybe you have some really important messages in your iPhone backup that you would like to transfer to your iPad. These could be important work messages or even court evidence. Your goal is to restore just the messages and not any other data available in the iPhone backup. 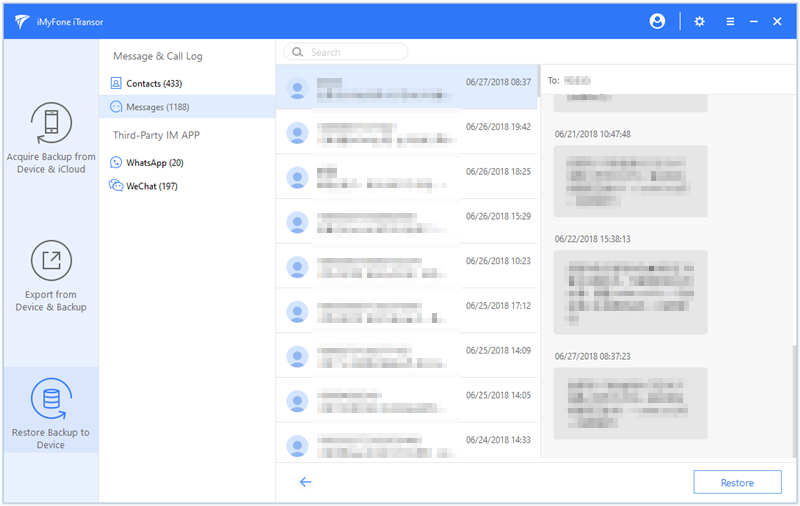 If you are in the above situation, you will wonder whether it is actually possible to restore iPhone backup to iPad messages. Luckily for you, technology has made this possible. But, can iCloud and iTunes do it for you? Let’s find out. Part 1: Can iTunes/iCloud Make It on Restoring iPhone Backup to iPad Messages? Neither iTunes nor iCloud will help you restore iPhone backup to iPad messages. One of the major flaws that both iTunes and iCloud have is that they are incapable of doing partial backups and partial backup restoration. If you are going to restore any backup you have on iTunes or iCloud, you have two options. You can either restore the whole backup or nothing at all. Another flaw these two Apple services have is that when they restore your backup, they will overwrite any data that was previously available on the device. The fact that iTunes and iCloud cannot restore your backup selectively does not mean that it is impossible to restore iPhone backup to iPad messages. 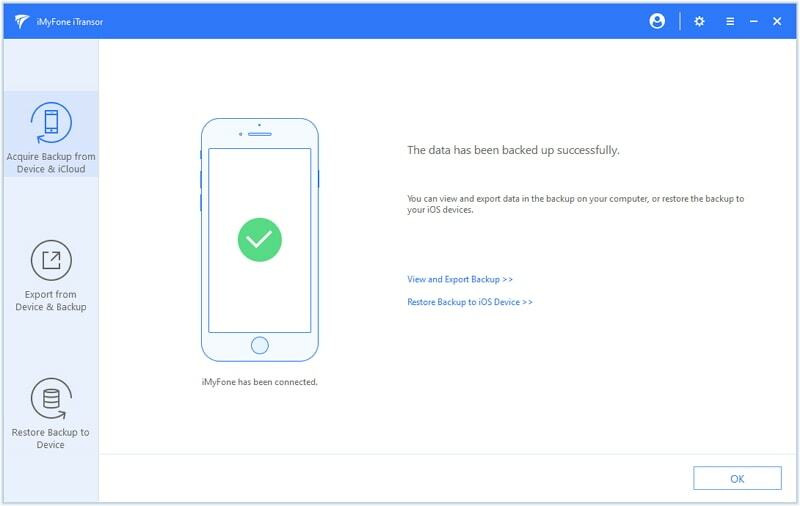 It is possible to restore a partial backup to your iOS device using a third-party tool known as iMyFone iTransor. 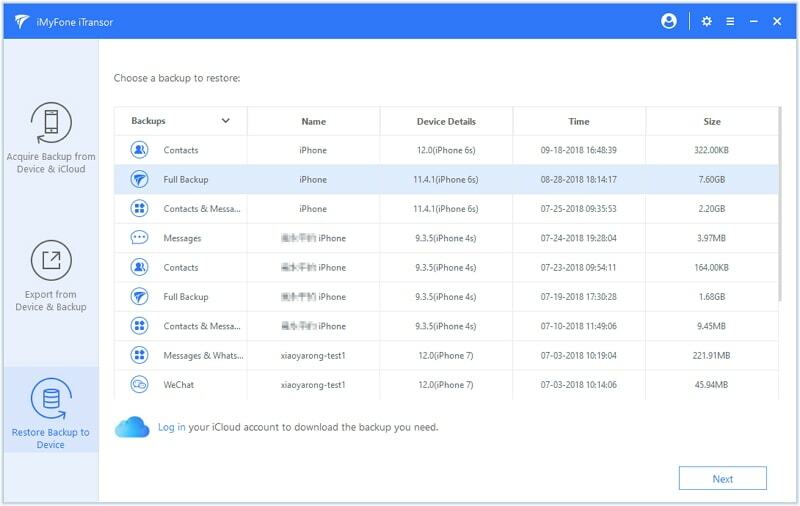 Before we show you how to use this tool to restore iPhone backup to iPad messages, we need to create the iPhone backup first. Step 2: Tap the iPhone icon on the left-hand side of the iTunes Window. Click Summary on the sidebar. Step 3: Under Manually Back Up and Restore, tap Back Up Now. Tap Done. Step 1: Launch Settings on the iPhone. Click the Apple ID which should be available at the top of the screen. Step 2: Click iCloud and then select iCloud Backup. Click Back Up Now. 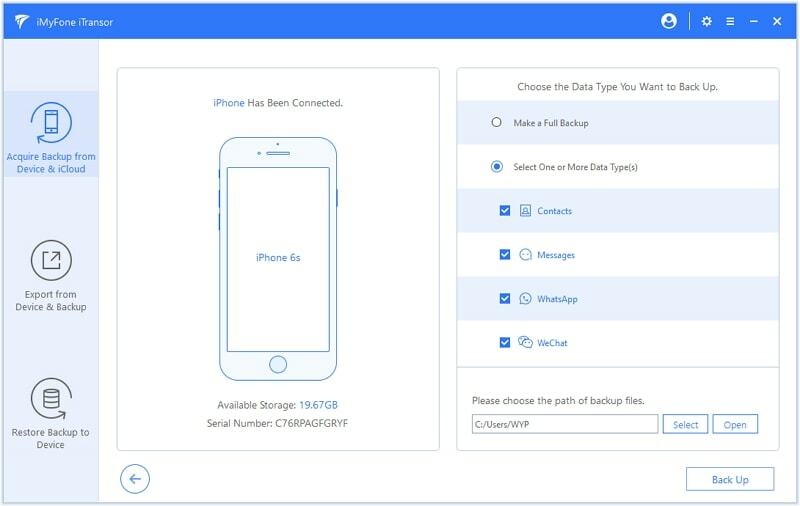 Note: To create an iCloud backup, your iPhone has to be connected to a stable Wi-Fi network. 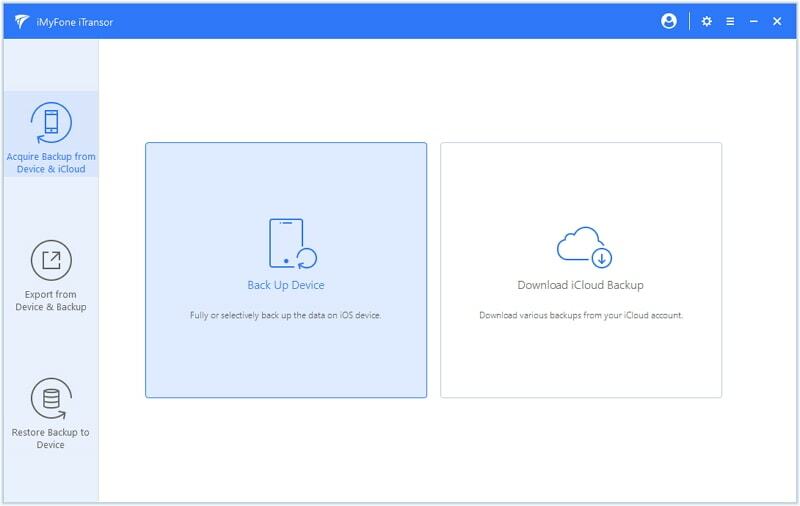 iTransor is different from iCloud and iTunes, since it not only allows you to choose whether to restore a full or partial backup but it also allows you to create a full or partial backup. 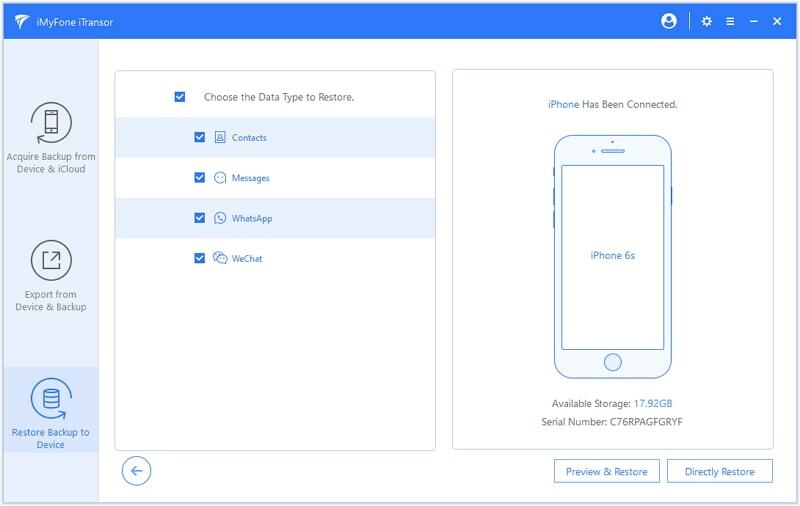 The tool will allow you to backup and restore only Contacts, WhatsApp, SMS, and WeChat. 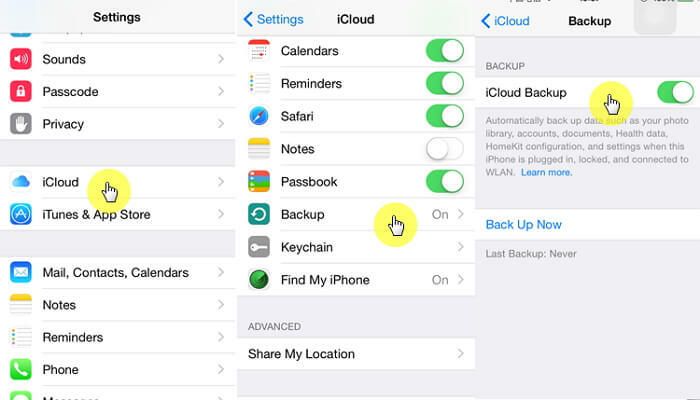 You can restore your backups selectively from iTunes/iCloud/iMyFone Backup. During the restoration, iTransor will not overwrite the data you have on your iOS device. iTransor works with all iOS versions including the most recent iOS 12 and iOS 11.4. Step 1: Launch iTransor and tap Acquire Backup from Device & iCloud. Tap Back Up Device. Step 2: Connect your iPhone. Trust the computer if you are connecting to the PC for the first time. Choose either Make a Full Backup or Select One or More Data Type(s). You can also select the backup path. Step 3: Tap Back Up to initiate the process. Keep the device connected to the PC until you receive a notification telling you that the backup is complete. Step 1: Launch iMyFone iTransor on your computer. 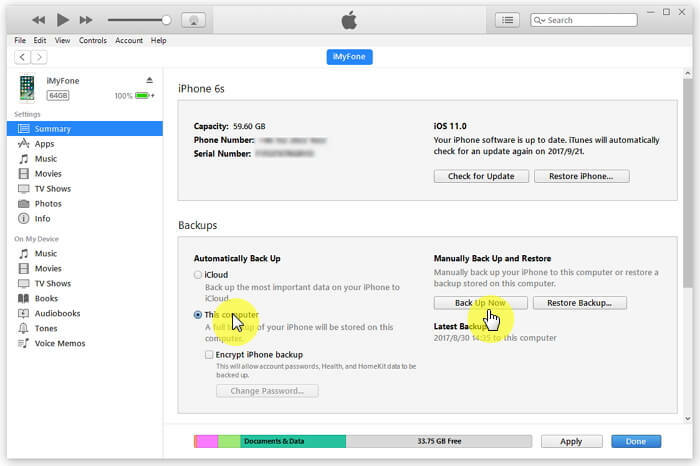 On the left-hand column, choose Restore Backup to Device. A list of all the backups you have on your computer will be listed. The list will include the iCloud backups you have downloaded to your PC, iTunes backups, and the backups you created using iMyFone iTransor. Choose a backup that has the iPhone messages you would like to restore to your iPad and then tap Next to proceed. Step 2: On the next screen, you will find 2 options. 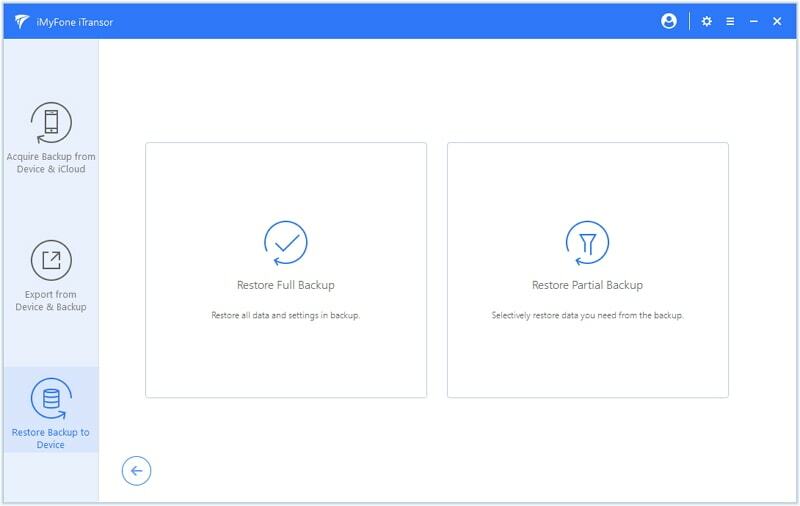 These are Restore Full Backup and Restore Partial Backup. Since your aim is to restore part of the backup (messages only), select Restore Partial Backup. On the screen that appears next, select the data you would like to restore. In this case, you can select only Messages. However, you are also allowed to select Contacts, WeChat, and WhatsApp. Connect your iPad before proceeding. Step 3: Select either Preview & Restore or Directly Restore. If you choose Preview & Restore, you will get to view the messages available in the backup before restoring them. After the preview, tap Restore to proceed. Step 4: On the popup that appears, select either Merge or Replace. 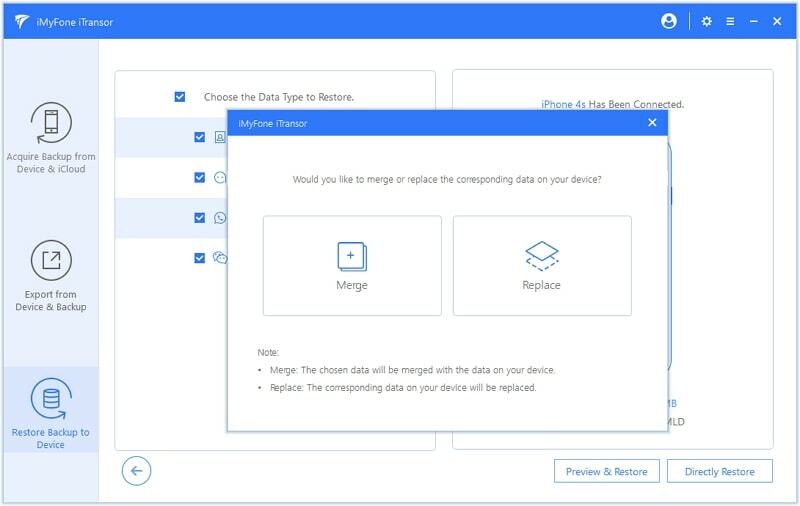 If you select Merge, you will combine the data you have chosen to restore with the one available on your iPad. If you select Replace, the corresponding data on your iPhone will be overwritten. Keep the device connected to the PC until you get notified that the restoration is complete. If you need to restore iPhone backup to iPad messages you can do that easily using iMyFone iTransor. This tool will allow you to restore your data fully or partially. In comparison to using iTunes and iCloud, iTransor is much better from this aspect. It does not overwrite the data that is currently available on your iOS device like both iTunes and iCloud do. We would like to hear from you. Feel free to leave your comment below. Questions are also welcome.